We went to see the second stage of the Vuelta in Assen yesterday. The 202 km stage started in the city and passed through twice more on the way to the finish in Emmen. There are many other videos on youtube, including a nice bit on the pave further south, some aerial shots including racing through Assen and the last few km and finish (just as we saw it on the local TV, but we had Dutch commentary). Tom Vanderbilt recently wrote an article in Slate which has been generating a few hits to my blog. He pointed to an article in the London newspaper, the Evening Standard which had covered cycle parking at London railway stations. To summarise, London has 2800 cycle parking spaces shared between 50 railway stations. It also has a population of around eight million people. On the other hand, Assen where we live in the Netherlands is a small city with just 65000 inhabitants and one railway station. But even at that railway station there are spaces for more than 2500 bikes (update 2013: Assen's railway station is being rebuilt with 3500 bicycle parking spaces). That's one cycle parking place at the station per 26 Assen residents vs. one space per 2800 Londoners. That's a full two orders of magnitude difference (i.e. 100x). Here in the Netherlands the railway company says that 4 in 10 railway passengers arrive at the station by bike. London has provided for just 1 in 700 railway passengers to be able to park a bike at the station. London frequently claims to be doing all kinds of great things for cyclists. The Mayor, Boris Johnson, has used such hyperbole as to suggest that London is a beacon to the world for cycling. However, the truth is that the city remains decades behind. Of course, London is far from the only place to be exaggerating it's achievements, and it can be confusing to work out what is worth looking at, but actually it's simple. For comparisons of railway station parking at other cities in the UK with a village here in the Netherlands, take a look here. For an article about how the Netherlands still doesn't have nearly enough, and what's being done about it, look here. Or take a look at the wonderful cycle park at the main station in Groningen which has 10000 spaces for 180000 people. Mark Wagenbuur has made a great new video showing how a street in Utrecht, the Amsterdamsestraatweg, has evolved over 200 years. Mark says "Good cycling infrastructure is also possible in old streets. This street in Utrecht (Netherlands) was designed by Napoleon when the Netherlands were part of the French Empire in 1812. It was part of the "Route Impériale no. 2" which connected Paris via paved direct roads with Amsterdam. The street design was changed several times in 200 years. 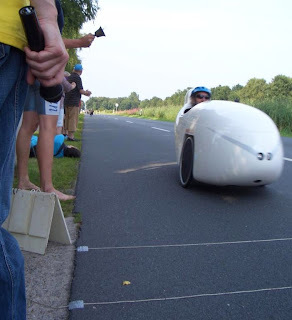 It got the separate cycle paths that exist today around the year 2000." While the video focusses on just one road so that the story can be told, it's important to point out that similar things have been done right across the nation in hundreds if not thousands of different locations across the Netherlands. This is also a video showing a bit more of the same street. 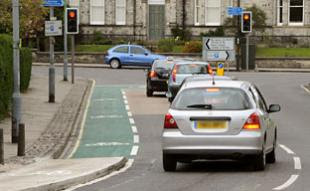 It carries on from where the other video left off, and includes some of the older infrastructure including on road cycle lane and junctions with no real priority for cyclists. Amsterdamize picked up on this song by the band pEp here in the Netherlands. It's got a chorus about how they can "Pedal towards freedom, in the wind and the rain, it feels heavenly good". Nice. I thought about posting this on here this morning, but was reminded as the last music I put on the blog was on played in the supermarket a few minutes ago evening. The more important news that Amsterdamize reports on is that there has been a recount of the number of km of cycle path. I've suspected for some time that the official figure of 17000 km was an under-estimate. The new official figure is 29000 km. It's still just an estimate. I've noted before that while Assen claims to have just over 100 km of cycle path, the people who keep them clear of snow and ice in the winter manage to cover over 200 km. York in England has a higher rate of cycling than most parts of that country. Joe Watt, the "cycling champion" of the city recently quit his job over a new piece of infrastructure. When asked if it was because the city was becoming anti car, replied that he thought that was the case. More here in the local news article. This is the scene of the trouble. The junction of Clifton Green and Water End. This road has perhaps been made ever so slightly more friendly for cyclists than it used to be, but it still falls drastically short of Dutch standards. The rate of cycling in York remains lower than that anywhere in the Netherlands. You can see why. Cycle facilities need to be much more subjectively safe and give cyclists an advantage in directness if they are to attract the majority of the population to cycling. Freewheeler's blog points out that Joe Watt's first action on taking the post was to denounce cyclists for taking part in a naked bike ride. Personally, I'm not that fussed about naked bike rides. However, I see such protests as an indication that all is not well with cycling. If conditions were good enough, there would not be much interest in such a protest. More news about this junction. The minor improvement made for cyclists three years ago is now to be removed. One step forwards... one step back again... This is not progress. This week has seen the 45th Jeugdtour Assen. It's the largest youth cycling event in the world. This year it is being named "Junior la Vuelta" to tie in with the Vuelta a Espana, which is starting here in Assen later this month - the first time ever that it has started outside Spain. Well done to all the competitors. Results are appearing on the website. In addition, I've learnt that the cycle racing track in Assen is to be improved. We've already got what I thought was a pretty good tarmac track for a town of 65000 (you can see some pictures in this video), but the existing 780 metre oval is to be extended and improved, and we'll gain a cyclo cross course, a national cyclo cross centre, a sportshall and a 200 metre wooden track. Excellent ! At 1:55 in the video there is an interview with a young cyclist from the UK (Cleveland Wheelers). I wonder if he realises he's been on TV over here ?